The latest conspiracy theory, as if we needed another one, is that the Chinese are up to something out in the Kumtag Desert. An article by Jesus Diaz over at Gizmodo called "Why is China Building These Gigantic Structures in the Middle of Nowhere?" shows a screen capture of a Google Earth view, with the arid expanses of eastern China overlaid with a strange pattern of white lines. The photograph is captioned, "What the hell, China? ", presumably because asking China "What the hell?" has resulted in their immediate cooperation in the past. magical patterns involving pentagrams and Masonic symbols. Well, okay, not so much. You'd think that if the Chinese were trying to create a mock-up of the streets of D. C. in order to "calibrate their optical targeting systems," it would conform perfectly, not just "sort of." On the one hand, the writer seems to think that the Chinese are up to something super-technological and amazingly top secret, and in the same breath that they can't draw a straight line. C'mon, you can't have it both ways. 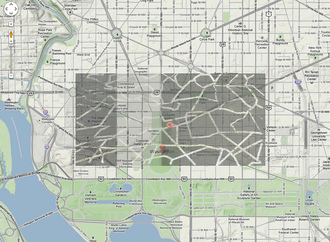 If they were trying to target D. C., it'd be kind of important to get the map correct, don't you think? It'd also be pretty easy, given that accurate street maps of major US cities have been available online for years. And after all, if they're trying to take out President Trump, wouldn't it be easier just to program their optical targeting systems to home in on the radioactive orange glow of his skin than to build inaccurate mockups of Washington D. C. out in some godforsaken stretch of Chinese desert? Of course, the problem with this conspiracy theory is the usual one; if you're allowed to rotate, shrink, or enlarge a random pattern of lines, you can always make it align to another such random pattern -- as long as you're content with a "sort of" fit. I'd bet that I could take the Chinese line pattern and make it align to the streets of Ithaca, New York, if I wanted to, and also if I had technological skills higher than that of a typical kindergartner, which I don't. It's like the post I did a while back about ley lines; if you can manipulate the data, and you're okay with an approximate match, you can always find a pattern. So, what are the Chinese really doing out there? Assuming, of course, that the pattern wasn't Photoshopped in by some hoaxer? The answer: I have no idea. But I'm going to go out on a limb, here, and state for the record that I'll bet it has nothing to do with alien landing sites, optical targeting systems, evil weather-control apparatus, or the Masons. On the other hand, if today an alien spacecraft adorned with Masonic symbols lands in the middle of downtown D. C. during a freak tornado, I will consider myself as standing corrected. Labels: aliens, China, conspiracy theories, Kumtag Desert, military base, street map, Washington D. C.